"This Thai influenced tuna steak with a light and aromatic salad is ideal for summer." Whisk together the ginger, lime juice, fish sauce, sugar, salt and pepper in a bowl until the sugar has dissolved. Slowly whisk in olive oil until incorporated. Set aside and refrigerate half of this mixture to be used as a salad dressing later. Whisk the garlic, lime zest, minced chile pepper, and cilantro stems into the marinade. Coat the tuna steaks with the marinade, cover, and let stand for 1 hour at room temperature. Preheat a large, heavy-bottomed skillet over medium-high heat. Once the skillet is very hot, remove the tuna from the marinade, and place into the skillet. Sear the tuna until golden brown on both sides, and cooked to your desired degree of doneness, about 2 minutes per side for medium, depending on thickness. Place the watercress in a large bowl with the cilantro leaves, cherry tomatoes, and sliced chile pepper. Pour in the reserved dressing, and toss to mix. 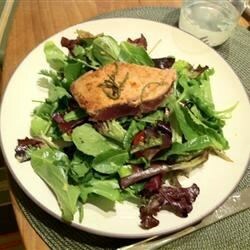 Serve the seared tuna on a bed of salad. Added the amounts for the olive oil, and included ginger in the directions. sooo good! tastes like the salad from a Thai restaurant. I would make this again with shrimp or chicken too. Good dressing to start with for the tuna and the salad; however, adding soy sauce, wasabi paste really enhanced the flavor. Thanks Alex! Great salad. Cooked to recipe. Wasn't sure about the watercress and cilantro salad but it isn't as overpowering as it sounds. Good Thai flavors, very limey.